Counterprotesters chanted on the periphery of Saturday’s "free speech" rally on the Common. That quip from late-night comedian John Oliver explains what Boston was really fighting Saturday on Boston Common. Not the tiny band of “free speech” protesters of indeterminate beliefs and ideology who were overwhelmed by thousands of self-proclaimed anti-hate counterprotesters. The real enemy is the old image that refuses to die, that of a racist city, where government and industry are dominated by whites, and people of color feel unwelcome, excluded, and even unsafe. The last thing leaders like Mayor Marty Walsh and Governor Charlie Baker wish to convey is any sense that neo-Nazis and white supremacists are welcome in a glittery, thriving metropolis that wants to be known as the new home of General Electric and the next hub of tech and innovation. The institutional racism and economic inequality baked into this town can’t be ignored. Only 13 percent of the students who attend Boston public schools are white, and 78 percent of the students are low income. 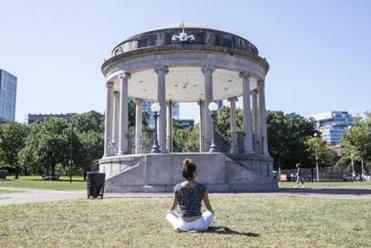 According to a recent report by the Federal Reserve Bank of Boston called “The Color of Wealth in Boston,” white households in Greater Boston have more wealth than African-Americans, Caribbean blacks, Cape Verdeans, Puerto Ricans, and Dominicans. Beyond that, Boston is still the city where a black baseball player reports hearing the “n” word at Fenway. In another troubling demonstration of intolerance, the New England Holocaust Memorial in downtown Boston has twice been vandalized this summer. Walsh is trying to change the picture. Over the last year, he has challenged business leaders to confront the lack of diversity in corporate Boston, and business is starting to cooperate. Eastern Bank and the Greater Boston Chamber of Commerce have both launched efforts to encourage minority-owned ventures and diversity. Walsh seems personally committed to the cause, but he also has good political reason to embrace it, given that one challenger, City Councilor Tito Jackson, is African-American. Meanwhile, white men still control most of the levers of power in Boston, and chants against neo-Nazis, the Ku Klux Klan, and fascists don’t change that. The huge response to Saturday’s rally should be seen as an important statement of public disgust toward vile groups and the hateful beliefs they espouse. 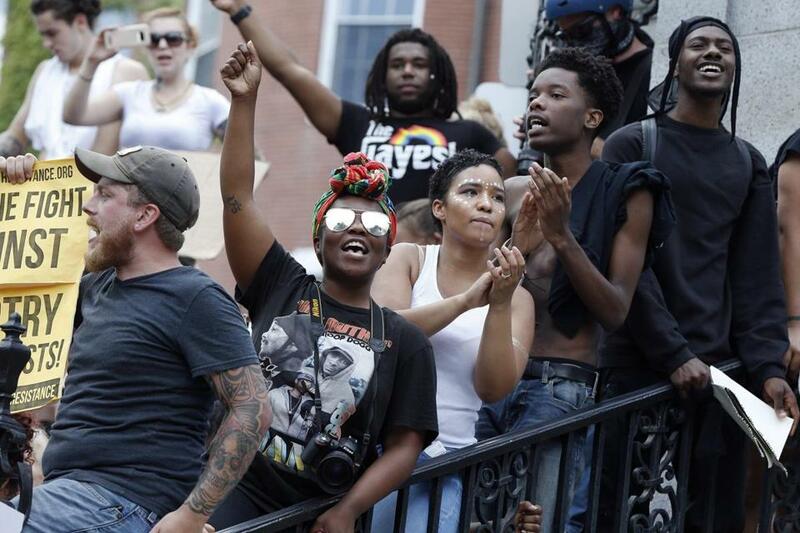 In some ways, the “free speech” rally-goers who showed up on Saturday paid the price for Boston’s racist history and its ongoing effort to rebrand itself. Fencing, concrete barriers, and 100 yards of grass separated the small group on the bandstand from the diverse crowd of thousands of counterprotesters who came to declare their opposition to hate. Free speech was sacrificed to a more pressing concern: presenting a fresh image of Boston to the world. The day belonged to counterprotesters who shouted “shame, shame, shame” and chased down people they called “Nazi scum,” even though no one absolutely identified as a Nazi was in attendance. The city got the headlines it wanted. Boston was making a stand against racism. Now it has to keep its promise to the people who took to the streets to denounce it. Organizing a march is easier than pulling its threads from the fabric of a city.